4 Ways To Save Money On Dog Treats & Cut Your Dog Treat Budget In Half WITHOUT Buying Cheap Dog Treats! 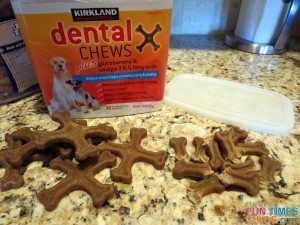 And he doesn’t realize that his favorite Dental Chews have 4 “arms” to them, forming a large pinwheel-shaped dog treat. He has no idea that Jerky Treats Tender Strips start out 6 inches long and that I break them into 3 or 4 smaller pieces. For the longest time, he thought Alpo Liv-a-Snaps were dime-sized tasty morsels, rather than the half-dollar sized treats that they are. Call me cheap (I prefer frugal), but I break almost all of my dog’s treats into smaller pieces and then dole out those small pieces as tasty rewards every time my dog does something good. Yep, almost all of the dog treats I buy, I break in half or — depending on their size to begin with — maybe even fourths! As a result, that means I get 2 to 4 times the mileage from a box or bag of dog treats than the manufacturer wants me to get — and we’re not talking about cheap dog treats either! It’s similar to my theory behind cutting Magic Erasers into smaller pieces, rather than using the full-size Magic Eraser like they want you to. By cutting them into smaller, single-use sizes you get many more uses from each Magic Eraser block. Not only does this make a bag or box of dog treats last much longer, but I’m also saving money — at least half of what I would spend on dog treats if I didn’t break them up. And trust me, my dog thinks the reward is the same, whether it’s a dime-sized treat or a half dollar-sized one. He’s a 100-lb Lab mix, and he will do just about anything for a morsel of tasty goodness, regardless of its size. Since your dog doesn’t know the difference between a small treat and large treat, why would you continue to “waste” money and fill your dog’s belly with full-size dog treats, as the manufacturer wants you to do? You don’t need to buy cheap dog treats to save money. Buy the good stuff, break ’em up and get so much more for your money! Your dog won’t know the difference. So, that’s the #1 way to save money on dog treats: Break Dog Treats Into Smaller Pieces. I buy most dog treats in bulk. Whenever they go on sale and/or I have a great coupon for the treats my dog likes best, I tend to stock up. Just remember, dog treats don’t last forever. So always check the expiration date on dog food and treats before you buy! 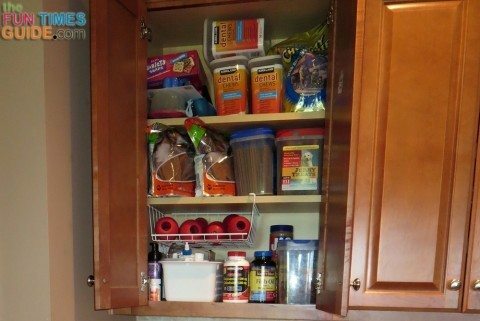 I use a Sharpie to circle the expiration date on each package, so it’s easy to grab the oldest ones first in my cabinet that’s filled to the brim with dog treats. One dog treat that I always buy in bulk: Biljac frozen liver morsels. Similar to what I do with storebought dog treats (break them into smaller pieces to get more for my money and to make them last longer), I’ve found that I can make an entire $5.99 bag of frozen Biljac last 1 year these days. The frozen Biljac comes in a 5-lb bag. As soon as I get home from the store (and the Biljac has thawed a tiny bit), I immediately repackage it into several small Ziploc bags. I end up with several plastic baggies — each containing a small clump of the moist liver morsels. I toss all the baggies into the freezer, and then just grab one as I need it. It’s a great way to stretch out one large bag of Biljac over the course of a year by creating single-use bags instead. While Biljac is a wholesome dog FOOD, I give my dog Biljac as dog TREATS instead. Sometimes, I’ll use it as a reward after giving my dog a pill. Usually, I stuff Kong toys with it. Trust me, it lasts a good long time when used in this way. And it’s a very special treat that my dog seems to appreciate — like a nice surprise — since he gets it so rarely. 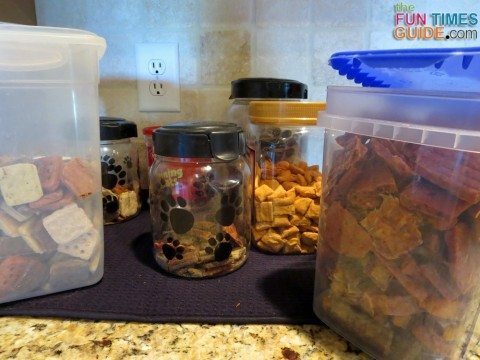 At first, I thought it was too much work to make my own dog treats. Buying them seemed so much easier. But I’ve come to realize that making dog treats yourself can save money! For one, you’re using things that you already have in your pantry. I love using up things, instead of buying more “stuff”! The best part: dogs aren’t as particular about ingredients (and taste) as we humans are. 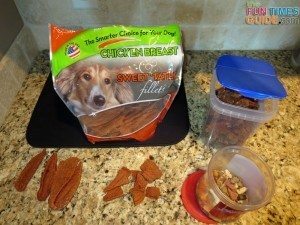 So it’s a cinch to toss together a couple of dog-friendly ingredients that you happen to have on hand and call it a “homemade dog treat”. Simple! I also like how you end up with bite-sized treats that are sized perfectly for your dog. And your dog gets treats that are fresher and generally healthier. So now I make homemade dog treats more than I used to. But the truth is you don’t always have to “make” homemade dog treats from scratch — using a recipe. Stuffed Bones – All you need is an old dog bone, a little peanut butter, and a freezer for these DIY dog treats! In addition to being a tasty treat for your dog, it’s a great way to repurpose a dog marrow bone after your dog gets bored with it. Ice Cube Treats – Put a couple pieces of dog food into each section of an ice cube tray. Fill with water (or low-salt broth), freeze, and call it a dog treat. Dogs love these… especially outside on a hot summer day! Stuffed Kong Toys – One of the most popular ways to create unique dog treats without a recipe is to stuff a Kong Toy with creative combinations of dog-friendly foods. You can freeze it to make it more challenging for your dog to get everything out, or just serve it right away for a tasty treat that’s also a boredom buster. It’s completely up to you how far you take it. Maybe you only give your dog homemade dog treats once in awhile. Maybe you go all the way and try to provide your dog with a homemade diet altogether. Either way is a win-win for your dog… and your pocketbook. In the end, by stepping outside the dog treat box and into your kitchen, you’re doing something great for your dog — because natural is always better than processed. And in case you’re wondering…. Yes, even when I’m making homemade dog treats from a recipe, I break them into smaller pieces before giving them to my dog. I tend to make each homemade dog treat very tiny and bite-sized — rather than making large bone-shaped treats like many DIY dog chefs like to do. In my dog’s eyes, size doesn’t matter… when it comes to dog treats. 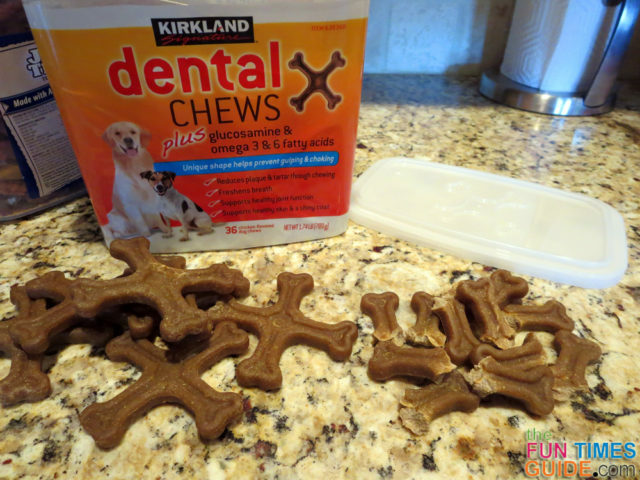 #4 – For Cheap Dog Treats, Think Outside The Snack Aisle! Don’t overlook the fact that you can give your dog various brands, flavors, and types (wet vs dry) of regular dog food as treats! Seriously. Dogs do NOT know the difference. They can’t read the label. Some give their dog’s own daily kibble as treats on occasion. That’s a really great (frugal) idea. And if your dog likes his dog food enough for it to also be a reward, then you’re in luck! That’s the ultimate win-win as far as cheap dog treats go. 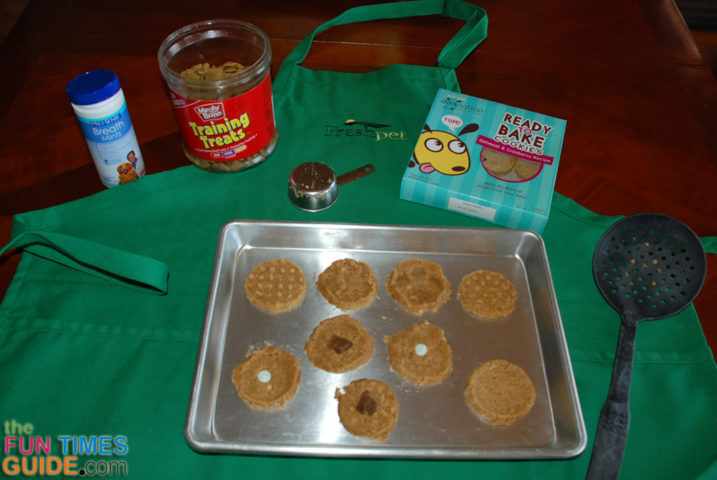 Here’s a fun way to make summertime dog treats using your dog’s own kibble. Personally, I use my dog’s own kibble inside interactive dog toys — like the Buster Cube and Kong Toy — all the time. In the Kong Toys, I like to combine my dog’s regular kibble with a variety of other things — just for variety’s sake. Some ideas: leftover pieces of tiny broken dog treats, Biljac frozen morsels, peanut butter, etc. 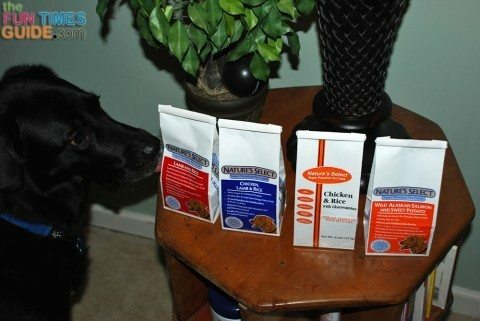 For everyday dog treats, I normally stick to my favorites (mentioned at the top of this article). But I’m always looking for an opportunity to mix things up, so I like to pick up various brands of dog food when it goes on sale REALLY cheap and/or I find an awesome coupon. Another great idea: grab a few small sample sizes of dog food. I used to do this at a local mom & pop pet store near me. Nutro, Science Diet, and others frequently have very small sample sizes of the newest dog food formulas — so a dog owner can make sure that their dog likes it before buying the bigger bags. Yep, regular dog food makes great dog treats — especially if it’s “new” to your dog. So I encourage you to use coupons (a) to save on the dog treats you normally buy… AND (b) to find new dog treats that your dog might like. There’s no denying that I give my dog a lot of treats daily. However, since dog treats are such a big part of my dog training routine, giving my dog treats throughout the day ends up being a win-win for both my dog and I. And I keep a close eye on his weight — which is important. By the way, does your dog have to “work” for his treats? Mine does. Here’s why. QUESTION: how many dog treats is too many in a day? ANSWER: Dog treats should make up no more than 10% of your dog’s total caloric intake. Check out this dog treat translator to see what “just one little dog treat” equals in human measurements! Break up the dog treats even smaller than usual. According to our vet, there was only one time my dog started gaining too much weight for his age and breed (and bad knee). We immediately cut back on the number of dog treats, made them even smaller, and paid close attention to the amount of food we were giving him each day. He got back to his normal weight in no time.